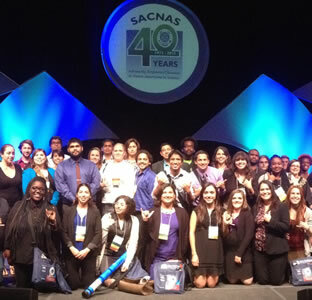 (Oct. 9, 2013) -- The Society for the Advancement of Chicanos/Hispanics and Native Americans in Science (SACNAS) annual conference commemorating the organization's 40th anniversary wrapped up over the weekend at the Henry B. Gonzalez Convention Center. Nearly 4,000 participants from around the country attended sessions at the four-day event tailored to support undergraduate and graduate students, postdoctoral researchers and career professionals at each stage of their careers as they move toward leadership positions in the sciences. 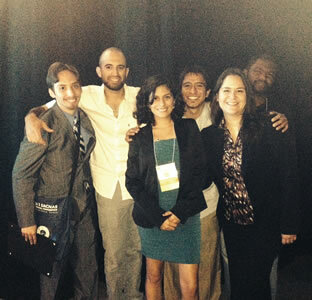 The activities included oral and poster presentations by 900 students representing universities throughout the United States and Puerto Rico. Ninety students from the UTSA College of Sciences, College of Engineering and College of Liberal and Fine Arts made presentations, and 43 students represented the College of Sciences Minority Biomedical Research Support (MBRS-RISE) program, Minority Access to Research Careers - Undergraduate Student Training for Academic Research (MARC-U*STAR), Work Study Research Training Program (WSRTP) and the Louis Stokes Alliance for Minority Participation Bridge to the Doctorate Program (LSAMP-BD). The winning entries received an official certificate and monetary award. "Synthesis of guanidylated amphiphiles and bolaamphiphiles for siRNA encapsulation in gene-silencing therapy"
"Do we predict as we age? An event-related potential study of sentence processing in Spanish-speaking older adults"
"Modifying mechanical and bioactive properties of hydroxyapatite scaffolds via collagen coatings"
"Determination of the effects of hyperbaric conditions on CMRO2 in rats during forepaw stimulation using fMRI"
"A structural analysis of twisted veins"
"That'll take them down a peg: Perceiving hypocrisy when threatened by others"